The Hunter Valley Gardens comprise 25 acres of beautiful green space. There are ten themed garden areas that are manicured and designed to represent the gardening techniques and styles of different parts of the world like India, the Orient, Italy etc. There are also every sculptures made from trees and stones alike that are worth seeing. The garden also has beautiful fountains and ponds. The Rose Garden is especially popular with visitors. During the Months of November to January, the Christmas Lights Spectacular takes place here and adds to the beauty of the place. There is a host of entertainment from performers to carollers that perform throughout the garden in the evening during this time. There are several easy pathways to explore the garden at your leisure. 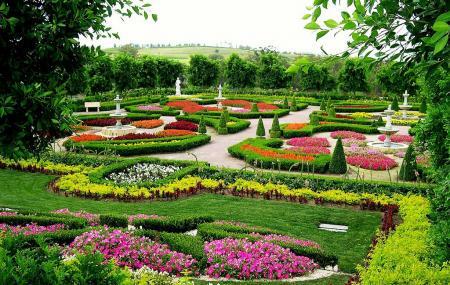 Tickets for Hunter Valley Gardens tours in Cessnock Australia open your way to some of the most picturesque views in the city. Hunter Valley Gardens tickets ensure that you get the most of this lovely city. As you buy tickets for Hunter Valley Gardens tours, you get the advantage of easy access and an insider’s knowledge of the attraction. If you wish to know the Hunter Valley Gardens ticket prices, you can visit our tickets section for detailed information. If you book your tickets online make sure you take a printout to be presented for entry as they contain a unique barcode. Go late to miss the crowds if visiting to see the Christmas Lights. General Entry for Children (4-15 yrs) $16.00 & Family Pass $60.00. Special Rates for Christmas Lights Spectacular from November to January: Only Night Tickets for Adult $25.00; Children (4-15 yrs) $20.00; Family (2 Adults +1 Child) $60.00; Family Pass Extra Child $17.00. Day & Night Tickets for Adult Day + Night (16yrs+) $44.00; Children Day + Night (4-15yrs) $21.00. Special Times for Christmas Lights Spectacular from November to January: Daytime Entry- 9:00 am - 4:00 pm (Monday to Sunday); Evening Entry- 6:30 pm - 10:00 pm (Monday to Sunday); Light Display- 7:30 pm - 10:00 pm. Love this? Explore the entire list of places to visit in Cessnock before you plan your trip. Fancy a good night's sleep after a tiring day? Check out where to stay in Cessnock and book an accommodation of your choice. How popular is Hunter Valley Gardens? People normally club together Hope Estate and Aqua Golf And Putt Putt while planning their visit to Hunter Valley Gardens.